While the obvious lure of the AAA Four Diamond Foxwoods Resort and Casino in Mashantucket, Connecticut, is gaming and entertainment, there’s enough demand for not just one, but two full-service spas. To escape sensory overload, guests can choose the G Spa or The Norwich Spa at Foxwoods. Each spa has a distinctly different vibe, yet both offer treatments inspired by Native American heritage. Foxwoods, North America’s largest casino, is owned and managed by the Pequot tribe on its reservation, which just 20 years ago was nothing more than woodland. At the G Spa and Salon, located at the MGM Grand hotel, designer Gretta Monahan created a sleek, modern aesthetic. In homage to tribal culture, several treatments incorporate the calming and cleansing properties of clay, maize, and various herbs. Red clay, combined with grapeseed extract and vitamins, is the main ingredient in a masque used in manicures and pedicures. Body treatments include a milk and honey wrap, a raindrop moisturizing wrap, and a raindrop massage. My treatment of choice was the 50-minute maize and mountain laurel body scrub. The 30-minute hydrotherapy pre-treatment takes place in the expansive women’s locker room, and includes ten minutes each in the waterfall Jacuzzi, eucalyptus steam room, and sauna. Following a break to relax and sip Harney & Co tea in the lounge overlooking the woods, I was escorted to the treatment room through a hallway with rose petals scattered on the floor. The body scrub consisted of a fine grain corn meal for exfoliation, and the sweetly scented oil derived from mountain laurel, the state flower. A sustainable resource, it's grown and sourced locally. After the scrub, a Vichy shower was drawn over me to wash it away, leaving my skin soft and delicately scented. The Norwich Spa at Foxwoods – part of the Grand Pequot hotel – is associated with the Spa at Norwich Inn, a historic property in a neighboring town. 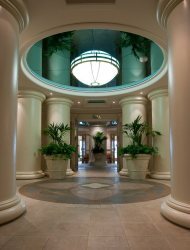 It is more traditional in its approach, treatments, and décor, which includes marble columns and urns, tapestries on the walls, and tile inlays under the rotundas. Services here represent classic European and American offerings, with the most popular being the Swedish and deep tissue massages. Native American themed treatments include the native hot stone therapy, as well as milk and honey manicures and pedicures. Other treatments creatively incorporate ingredients like caviar, espresso, seaweed, chocolate, and the spa’s private label Apricot Harvest products. Both the G Spa and the Norwich Spa have indoor pools and fitness facilities, and offer a full range of services, from haircuts and make-up application to full-day treatment packages. For general trip-planning information, see our Connecticut Travel Guide.